Ha! We are now into my favourite weather blogging time of year. From the wet wet day on Tuesday last week to 2 scorching hot days on Thursday and Friday, and then just as I thought we'd have a nice weekend, BAM! The first real low season double whammy of the year. 2 days of really sh*tty wet and windy weather on Saturday and Sunday. Maybe the wettest days of the year, certainly the wettest weekend. The wind was strong too, lots of bits of tree all over the roads on Sunday morning, and lots of water on the roads both days. Our garden was soggy, but the area around our house does not flood. Saturday morning was actually not too bad. I took the kids out for some breakfast at a little restaurant on the edge of Phuket town near the Darasamut School. One noodle soup, one fried rice with chicken, one omelet with rice, ice tea and water.. 95 Baht. I think we'll go there again! But the rain started late morning and did not stop all day, so it seemed. Certainly not beach weather and I was not thinking of heading out to take arty dark sky photos either! In any case, poor Jamie has been a little under the weather for a few days so an easy day at home was not a burden! Dive trips were cancelled, winds were up to 25 knots, waves of 3m or more.. and of course the electricity went off at our office. Twice. A total of 3 hours without power on Sunday afternoon. It had dried up by late afternoon and today has been dry so far with patches of sun, but still windy and again some dive trips did not run due to the big waves. Very sensible. Big waves are not safe and not fun! Just read in the news today that a ferry sank between Phi Phi and Phuket yesterday - no customers on board, and the 5 crew got off safely. Sunk by big waves. Thai news reports floods in Phang Ngs province, and Khao Sok national park is closed for a few days. Also reports of heavy rain on the east coast in Surat Thani and Chumphon. 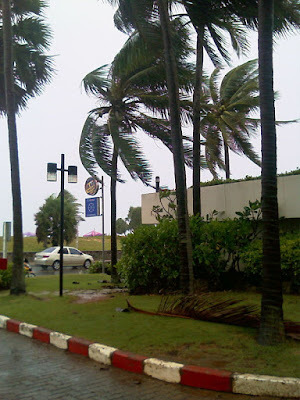 Camille reports similarly wet and windy weather on his Koh Samui blog. The Nai Yang weather station also shows graphs of recent data - rainfall, windspeed etc.. It says the rainfall was nearly 60mm on Saturday and over 80mm on Sunday. This may vary with exact location, but anyway... very wet. The wind forecast on Windguru is showing some sustained winds from the west for a few more days, calming slightly, but for sure this is the first of the real monsoon storms. We'll get these now and then, lasting 2 - 3 days. Nothing destructive, but certainly not what you want on a beach holiday :) Just remember there is more to Phuket than beaches. Get out and explore - have a look at Things to Do in Phuket.